These are the results for the second survey, on how well people know the funeral industry. This survey was only ever intended as a test, to see if certain concepts were worth exploring further. In that regard it was a huge success as tje results were rather informative and interesting (at least for me). Recall and recognition are two cognitive psychology terms for specific types of memory retrieval. Recall is when the information is freely remembered without any assistance or prompts. For example, being asked to name five funeral homes off the top of your head or being asked to name a company slogan. This type of memory retrieval is quite difficult and thus less successful. Recognition is memory retrieval with assistance or a prompt, 'recognising' the information in other words. For example, being given a funeral home logo and asked which company it belongs to, or seeing a list of company names and being asked which sound familiar This type of memory retrieval is much easier and has a higher success rate. These were the two types of memory of funeral companies tested in the survey. To test how well people actually remember and know the funeral industry and the companies within it. Of all surveys this one had the most diversity in terms of respondents. Only 70% were female and as figure 1. demonstrates there was a more even scattering of ages. 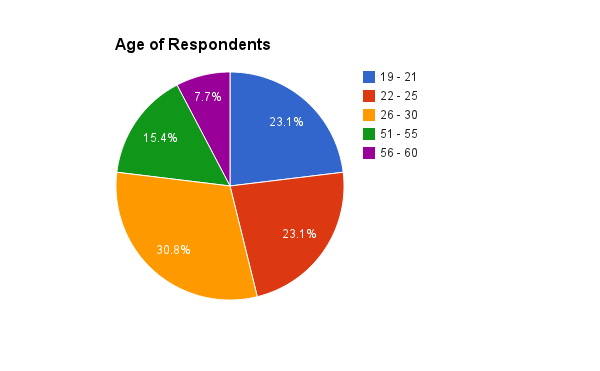 The single largest group was 26-30, being only 30.8% of respondents. This larger diversity across age and gender would only help to gather more reliable results. Age and gender were compared with the results, but no correlation was found. So it would be safe to assume that neither age nor gender had an influence on the outcome. Another possibly factor is location as the study is only about Sydney funeral companies, 93% of respondents were from Sydney. As this is a Sydney industry based survey one would assume those not from Sydney would not do as well. Surprisingly this was actually not the case. Those few not from Sydney had very similar results as those from Sydney. Yet this might change with an increase in respondents. The largest factor was whether respondents had previously or currently work in the funeral industry. 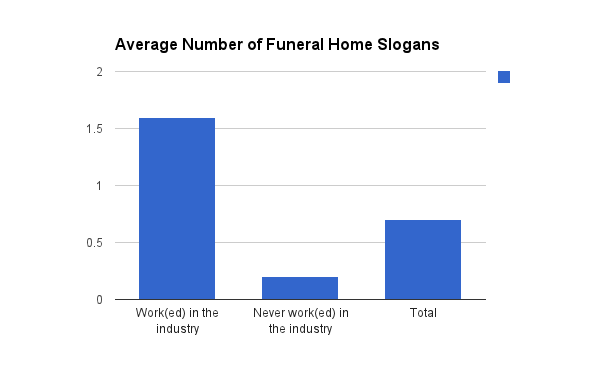 Only 58% had not worked in the industry, and these respondents were very different from those who work(ed) in the funeral industry. Generally those who work(ed) in the industry had a much higher recall and recognition rate. As recall is much harder and the funeral industry not generally that known one would assume this would be rather low. That most people would not recall company information with great success. 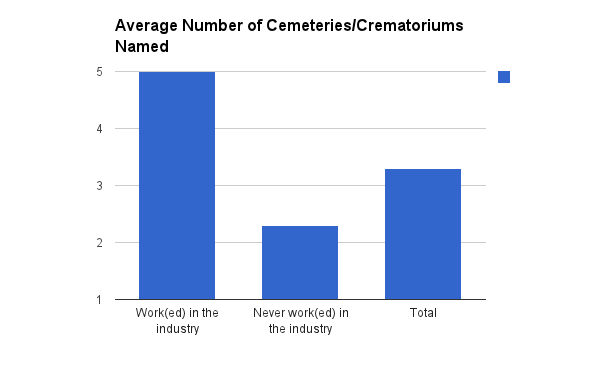 The average recall rate for those who work(ed) in the industry was 5 out of a possible five crematoriums and/or cemeteries. The average recall rate for those who never work(ed) in the industry was much lower, at 2.3. While the total average was 3.3. Those who work(ed) in the industry had a much higher recall rate than those who did not. This was highest recall group over every group. It makes sense for this to be the highest recall group and is consistent with all other research up to this point. People (both mourners and funeral staff) consciously look up cemeteries/crematoriums. Mourners look it up and discuss the name when planning the funeral and memorial (such as graves or plaques) afterwards. Undertakers look up these places for the job, planning how to get to and from them as well as submitting papers and making bookings. We process the crematoriums more often and more consciously and with more thought involved. So it is expected that they have a higher recall rate. 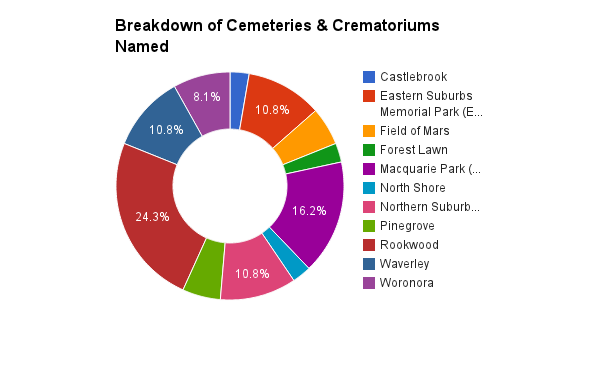 At 24% Rookwood was the most named cemetery/crematorium. Coming in second was Macquarie Park with 16% followed by Eastern Suburbs Memorial Park (ESMP) and Northern Suburbs Crematorium (NSC) equally. This recall is oddly similar to the size of the places and how busy they are. Correlation does not mean causation, but it is an unexpected observation. The average recall rate for those who work(ed) in the industry was 4.8 out of a possible five funeral homes. While those who never work(ed) in the industry only had an average of 2.1. On it's own this is a big difference, but compared with the total average of 3.1 we notice something important. That those who work(ed) in the industry had a noticeably higher recall rate. A trend which will continue on every question. This group had the second highest recall rate for both those who work(ed) in the industry and those who never work(ed) in the industry. This is not unexpected as funeral homes directly market and advertise to the public. As well as the fact that they are often the first point of contact for many organising a funeral. 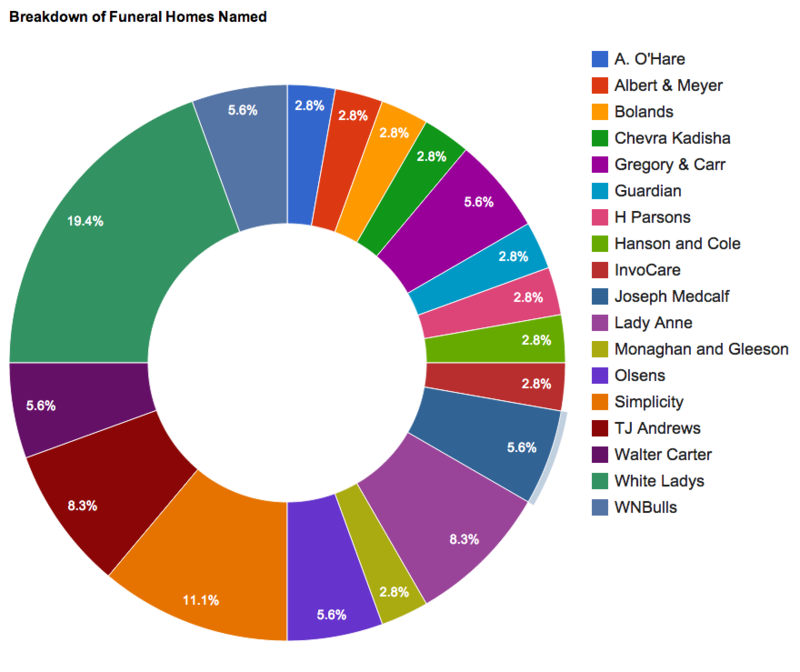 At 19% White Ladys was the most named funeral home and Simplicity was second with 11%. It was no surprise to see two InvoCare brands at the top. Particularly White Ladys who are arguably the most active funeral home in terms of advertising. Oddly the other InvoCare brand Guardian was one of the least named companies. 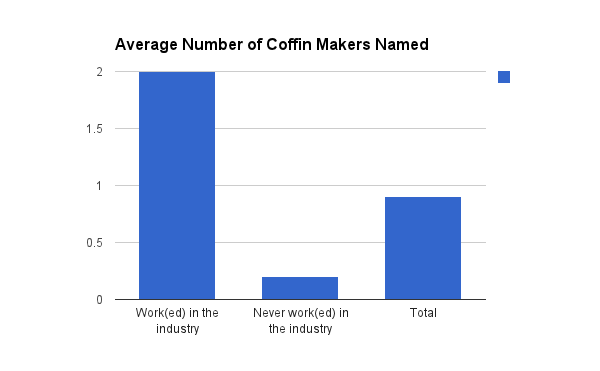 The average recall rate for those who had work(ed) in the industry was 2 out of a possible two coffin makers. The average for those who had never work(ed) in the industry was 0.2. While the total average recall rate was 0.9. This group had the second lowest recall rate of all four groups. Which is not to be unexpected as coffin makers do not advertise to the public. For the most part these companies rarely interact with those outside the funeral home. However, those who work(ed) in the industry interact with these companies quite often. From ordering and receiving products to discussing the products and meeting people from these companies. The average recall rate for those who work(ed) in the industry was 1.6 out of a possible two slogans. The average recall rate for those who never work(ed) in the industry was 0.2. While the total average was 0.7. This was group had the lowest recall rate of all four. Phrases can be difficult to remember, in this case it turned out that they were very troublesome for most. For both those who work(ed) in the industry and those who never had. Overall the recall rates were within expectations. Those who work(ed) in the industry had a much higher rate as they have first hand and regular experience with these groups. It is only expected that these respondents would have a higher recall rate. Especially compared with those who never work(ed) in the industry. Yet it was surprising how low the recall rate for slogans was for both types of respondents. Slogans are things designed to be memorable and individualise a business or brand. To have such low recall rates is odd and warrents further investigation. Recognition is the easiest form of memory retrieval, and thus should have the highest success rates. Those who work(ed) in the industry named an average of 15.6 out of a possible 22 funeral homes. Those who never work(ed) in the industry named an average of 6.5. While the total average was 10. This was quite a surprise as I expected a much higher average recognition for both groups. Funeral homes advertise to the public and interact with the public. Many outside the industry should have come across them on several occasions. Especially as the last survey found 55% of people had attended five or more funerals as a mourner. Also, those who work(ed) within the industry should have heard of several different company names regularly. All funeral companies picked for this list were ones I have heard various people talk of and are easy to find with a general search on google. Respondents were asked to look at a name, logo, slogan or hearse and match it with the company it belonged to. All names, logos and slogans were selected on how prominent they were on the company material and how easy they were to find in google. This was done so the most prominent (and in theory the most known) were selected. However, WNBulls was also chosen as a control of a sort. I personally know this company has a strong and deliberate policy not advertising or do any promotional work. Thus WNBulls would be good to compare with companies who did advertise and promote. To truly explore how effective this advertising is and how well people understand the industry. Which unfortunately failed as is explained in the 'Slogan' section below. When asked about the Simplicity name of those who never work(ed) in the industry 62% recognised it correctly. Of those who work(ed) in the industry 100% recognised it correctly. When asked about the Walter Carter name 38% recognised this correctly. Of those who have work(ed) in the industry 60% recognised this name correctly. When asked about the Acropolis name 25% of those who never work(ed) in the industry recognised this correctly. Of those who have work(ed) in the industry 60% recognised this name correctly. When asked about the Macquarie Park name 37% of respondents who had never work(ed) in the industry recognise it correctly. While 100% of those who have work(ed) in the industry did recognise it correctly. When asked about the Sereno name none of those who never work(ed) in the industry recognised this correctly. Of those who have work(ed) in the industry 60% recognised this name correctly. Unsurprisingly the InvoCare company had the highest recognition rate for both types of respondents. This is because InvoCare advertises heavily, is very spread out and is discussed extensively by many. It would only be expected for InvoCare brands to be more recognised than the others. Generally names were overall the most recognised category. Both those who never work(ed) in the industry and those who had were more likely to correctly identify the company name. This was not to be unexpected as company names tend to be prominent and tied with the company's theming and branding. When asked about the White Ladys slogan 63% of those who never work(ed) in the industry recognised this correctly while a surprising 25% said it belonged to Lady Anne. Of those who have work(ed) in the industry 60% recognised this slogan correctly. When asked about the Woronora slogan 13% of those who never work(ed) in the industry recognised this correctly and 25% said it belonged to a funeral home. Of those who have work(ed) in the industry 40% recognised this slogan correctly. When asked about the WNBulls slogan 12% of those who never work(ed) in the industry recognised this correctly. Of those who have work(ed) in the industry 20% recognised this slogan correctly. When asked about the Mannings slogan none of those who never work(ed) in the industry recognised this correctly. Of those who have work(ed) in the industry 20% recognised this slogan correctly while another 20% said it belonged to other funeral homes. Slogans were the second most recognised category overall. The White Ladys slogan was by far the most correctly recognised by both types of respondents. While this slogan was sometimes confused for another company it still had a very high recognition rate. And as is discussed in the 'Hearse' section below this confusion works both ways. Surprisingly the WNBulls slogan did better than the Mannings one. I followed this up with a couple of people who I knew that had done the survey. Trying to work out why a company who deliberately does not advertise in any way and actively avoids attention got more recognition than another. These people said how they knew the WNBulls slogan from my blog. That I had discussed WNBulls quite often and they'ed either looked it up or seen me mention the slogan. This means the results for WNBulls are bias as the survey was done through a blog which has discussed the company often. Basically I had been promoting WNBulls through my blog which was the same pool of people who did the survey. When asked about the Guardian logo 12% of those who never work(ed) in the industry recognised this correctly. Of those who have work(ed) in the industry 100% recognised this logo correctly. When asked about the TJ Andrews logo none of those who never work(ed) in the industry recognised this correctly. Of those who have work(ed) in the industry 50% recognised this logo correctly. When asked about the WNBulls logo none of those who never work(ed) in the industry recognised this correctly. Of those who have work(ed) in the industry 50% recognised this logo correctly. When asked about the Macquarie Park logo none of those who never work(ed) in the industry recognised this correctly and 13% stated it belonged to a funeral home. Of those who have work(ed) in the industry 100% recognised this logo correctly. When asked about the LifeArt logo none of those who never work(ed) in the industry recognised this correctly. Of those who have work(ed) in the industry 100% recognised this logo correctly. Logos were not well recognised, even InvoCare brands faired poorly for the most part. Which was odd considering logos are heavily tied with theming and branding. Take the Guardian logo for example, it is green and black in the company colours, the same green and black which appear on everything of theirs. Or the TJ Andrews logo which is not only in the company blue but is stuck on so much, from flyers to notepads. Despite this the logos are not well recognised by either type of respondents. When shown the Guardian hearse none of those who had never work(ed) in the industry recognised it correctly. Of those who have work(ed) in the industry 100% recognised it correctly. When shown the Simplicity hearse none of those who had never work(ed) in the industry recognised it correctly. Of those who have work(ed) in the industry 100% recognised it correctly. When shown the TJ Andrews hearse none of those who had never work(ed) in the industry recognised it correctly. Of those who have work(ed) in the industry 100% recognised it correctly. When shown the Lady Anne hearse none of those who had never work(ed) in the industry recognised it correctly, while 13% said it belonged to White Ladys. Of those who have work(ed) in the industry 100% recognised it correctly. When shown the WNBulls hearse none of those who had never work(ed) in the industry recognised it correctly. 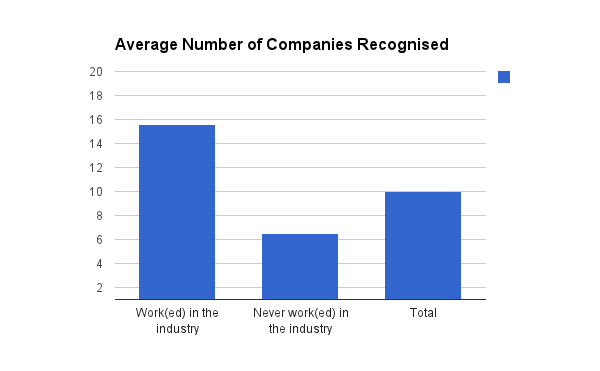 Of those who have work(ed) in the industry 50% recognised it correctly. The hearse was by far the least correctly recognised of all four. Those who never work(ed) in the industry were unable to recognise any hearse correctly. Yet for those who work(ed) in the industry this category had the highest correct recognition. Only the WNBull hearse was mistaken, being confused with Guardian and Elite equally by 50% of respondents. This questions much of the effort put into making the hearse unique. Many companies and individuals put a lot of time and cost into making their hearse individual and unlike any other. WNBulls went as far as to keep secret where it got the chrome bars for their hearse so nobody could get the same bars. And yet this hearse was readily confused with Guardian or Elite. Perhaps the hearse speaks not to the public but to those within the industry. That those outside the industry just see "a hearse" and look at nothing past the colour. While those from inside the industry do not see "a hearse" but see a significant symbol of a company. This difference in importance given to the hearse would explain the rate of recognition. Interestingly the Lady Anne hearse was thought to belong to White Ladys. The two companies compete in terms of style and branding and thus identity. Their identity becomes confused and blurred, which works both ways. Some think of the White Lady slogan as belonging to Lady Anne and others think of the Lady Anne hearse as belonging to White Lady. The trends from the recall section were continued, if not emphasised, in the recognition section. 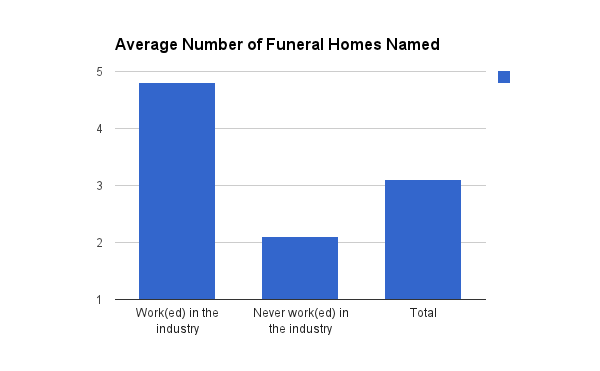 Those outside the industry (as in the ones who have never work(ed) in the funeral industry) are less likely to know the industry. And this is not simply because they have never work(ed) in the industry. Some might assume employees of an industry tend to know it better, which is true to an extent. But the difference is quite big here. Too big to simply attribute it to this one possible factor. Perhaps there is more going on, other reasons not reviled by this simple survey. Coffin makers were clearly unknown by those who never work(ed) in the industry. Which is exactly what was expected. These companies rarely interact with the public, providing their products through funeral homes. Those outside the industry would hardly have heard of these companies, and know very little about how they operate. Even InvoCare's LifeArt which is quite active was unknown by those outside the industry. Cemeteries and crematoriums had a higher recognition and recall rate for all respondents. As stated above one likely reason is simply due to how these places are used. In that cemeteries/crematoriums are consciously looked up, and a decent bit of thought is put into them (as in preparing paperwork or planing the route). The more cognitive effort put into thinking about something like this the better we learn it. Something simple like planning a trip to a place like this would significantly increase the recognition and recall rates. This is a good indication of how differently funeral homes and cemeteries are seen and used. The cemetery/crematorium becomes a consciously important place for many. One easily named and often known of. On the other hand the funeral home is not interacted with this way. People rarely look at it consciously and deliberately. Again this was demonstrated with the recognition of specific company information. Company names and slogans were relatively well recognised. Yet slogans and especially the hearse had a considerably low recognition rate. The hearse in particular exemplifies this idea. How much time and cost is put into it to be unique and individual. And none outside the industry even notice this. Overall this survey was quite informative and interesting, for me at least. Hopefully I will find time to follow up some concepts raised here with more research. It says a lot about how we see and interact with the funeral industry so it is worth exploring properly. Of course one must remember that this survey was done with limited numbers, and with a limited group of people. Which did actually impact the results, as seen with the WNBulls recognition questions. So the results might be interesting and informative, but they might not be applicable or reliable in other situations. This was only ever intended as a 'test' survey, to see if the ideas were worth exploring. More research is clearly needed before any substantial conclusions can be reached.